Today marks the 80th day of home school!! I am trying hard to pack in the days before the baby comes in February. I ended up having off this entire week. Unfortunately I was sick on Monday and there were icy roads yesterday and I had already decided to not teach tonight. Although I was sad to miss my students, having this time to be in my PJs all week has been delightful. I guess I will need to change into real clothes later, but for now I have enjoyed staying in. 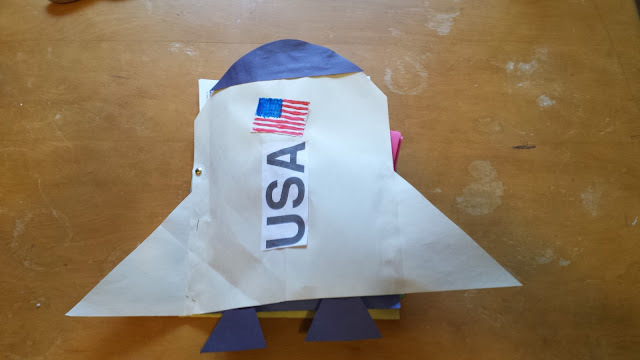 This week we changed up our school to do a unit on space. We did a pocket unit and had fun putting all the parts together. I think we also read about six books about space over the three days. It was a ton of fun, and a great little diversion right before Thanksgiving. The second pocket was a ton of fun for me and Kaelyn. 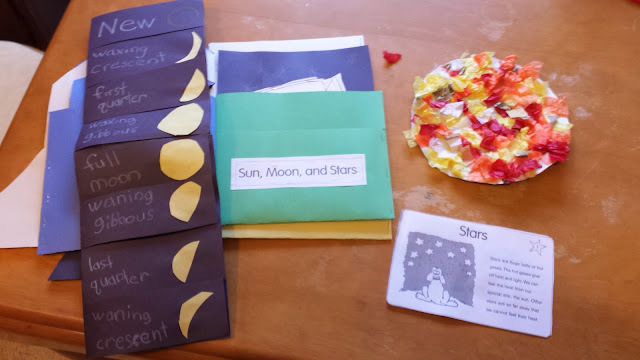 We made a tissue paper sun (which took forever and Sebastian got bored about 3/4 of the way through the project), read about the sun and stars, and learned about the phases of the moon. I wanted to do the Pintrest Oreo moon phases idea, but I forgot to plan for that. Sebastian forgave me, lol. The last pocket was about space travel. We have been watching the rockets being blast lately by NASA so this was the most fitting for Sebastian. 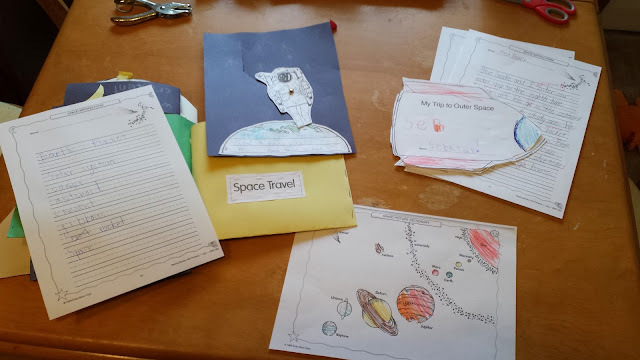 Besides writing a sentence and working on vocabulary words, I had him write a story entitles, "My Trip to Outer Space." I even made him do a few drafts, in order to get him to use strong verbs and adjectives. I did the writing for him since the story was a little longer than what he writes currently. Blue Snake and I anxiously enter our rocket ship for the eighth time. It blasts off. 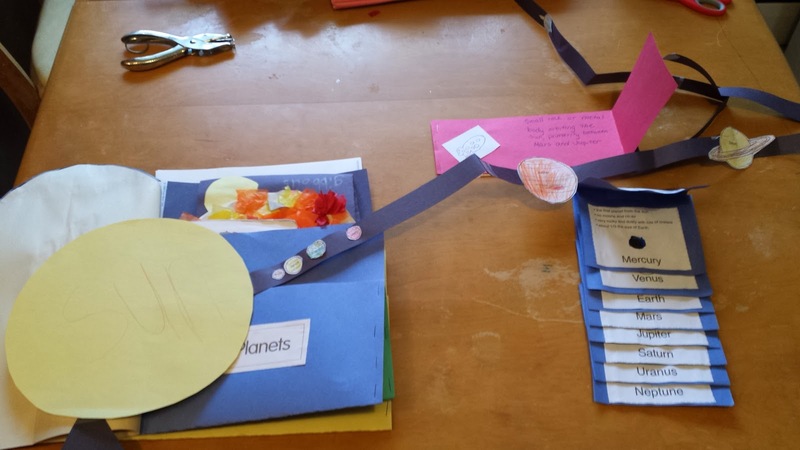 We fly into the asteroid belt and get out to study one. We get bumped violently by Kaelyn's spiky rocket ship. We crash into Mars! Blue Snake realizes that he can stretch super far. He stretches to the rocket. We fly home, relieved that we are headed home, but mad at my sister. Kaelyn made a super adorable turkey handprint this week. 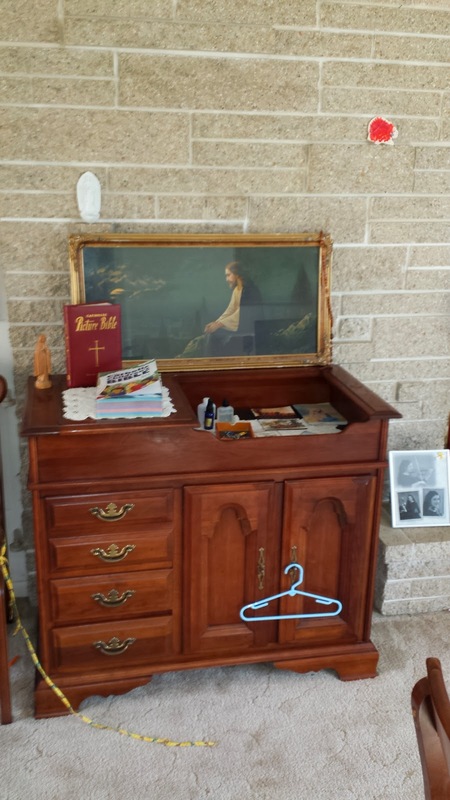 The beginning of our home altar- Jesus picture, Mary statue, two Bibles, three bottles of holy water, medals, rosaries, and some prayer books. One of the things I am most proud of is our home altar. We just started it this week, and my son loves it. We have added things to it since I took this picture. The kids created Welcome signs for Jesus, a Catholic mezuzah which holds the scripture Mark 12:30 (You shall love the Lord your God with all your heart, with all your soul, with all your mind, and with all your strength. ), and a St. Joseph prayer card we found in my office desk. We have plans to add more, as we come across statues and more. Sunday starts Advent!! I am very excited. This is one of my favorite times of the year. We will be doing a paper Jesse tree on the wall this year, to help with a lack of space in the house. Each child will get his/her own tree so that there is no complaining or fighting. I found cute green and glittery wrapping paper I will be cutting in the shape of a tree and putting on the wall. Each kid has a different start to top the tree as well. We will be following the Holy Heroes Advent Adventure and their Jesse Tree DVD for the ornaments. I have already had the ornaments printed onto cardstock and cut them out so we are ready to go! Next week we will also go back to our regular curriculum. The break this week was nice, but there was a ton of extra planning I had to do with making copies and cutting things ahead of time, so I will be happy to get back to our normal stuff.